Heralded as a medicinal food across Asia for millenia, the humble green mung bean is believed to pack a powerful punch in detoxification of the body. Reputed to help lower blood pressure, boost immunity and lower the risk of numerous chronic diseases, these little legumes are high in dietary fibre, protein and a bevy of nutrients including manganese, magnesium, copper, folate, zinc, and a few B vitamins. They can be added raw and sprouted to salads and sandwiches, or cooked within your existing recipes for stews, soups and casseroles. The Ayurvedic tradition encourages the use of cooked whole green mung beans to reap the full benefits of their detoxification properties. This densely nutritious soup is filling, cleansing and delicious. Don’t be overwhelmed by the list of ingredients, the majority of which are spices which are valuable pantry additions. Thoroughly wash the mung beans and put aside. Line the spices up ready to go or you risk burning the spices while you’re looking for the next one. Heat the ghee in a heavy bottomed pot or pan on a low heat. Add the fenugreek, mustard and cumin seeds. Once the seeds are sizzling (but not burnt), add the curry leaves, chilli and ginger and stir. 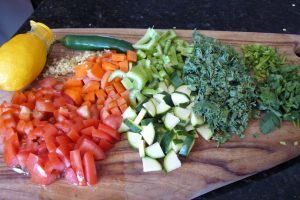 Add the tomatoes, turmeric, ground coriander and coriander stems and stir for a few minutes until the tomatoes start to soften. 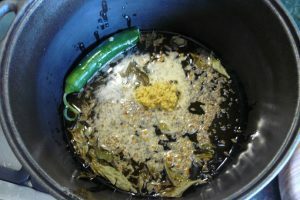 Add the mung beans,water, vegetables, salt and sugar, turn up the heat and bring to the boil, then reduce the heat and simmer for 40-45 minutes or until the mung beans are soft and breaking apart. 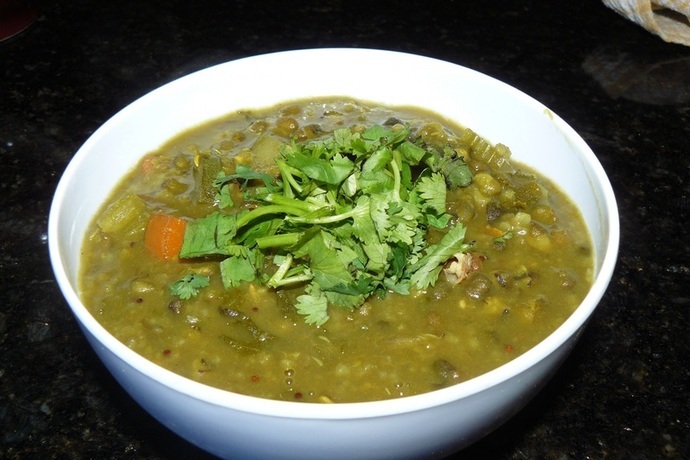 Serve the soup into four bowls, pour equal amounts of lemon juice over each, and garnish generously with coriander. Serve on basmati rice and with naan or pappadums for a more filling meal. This can be cooked in a pressure cooker in 20 minutes. The bulk of ingredients can be purchased from an Indian grocery store.